Grizzly Paws Premuim Weightlifting Gloves, soft and durable, cowhide leather with spandex back, padded palms and fingers. Reinforced stitched stress areas, velcro® closure. In January of 2005, Grizzly Fitness was contacted by a woman named Kristen Wulf. 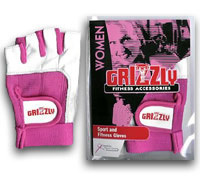 She had explained to me that she has been using Grizzly products for many years including a pink pair of exercise gloves that we created 10 years ago. Last year she was diagnosed with Breast Cancer. After enduring all of her treatment Kristen is in need of her pink gloves once again as they are now worn out. She explained that physical activity especially upper body exercise helps decrease lymphedema, which is a possible side affect of breast cancer treatment. Lymphedema involves the swelling of soft tissues of the arm or hand. The swelling may be accompanied by numbness, discomfort and sometimes infection.